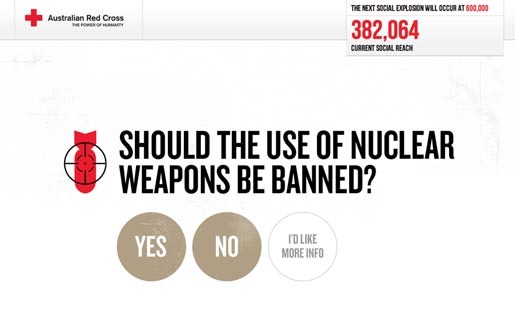 Australian Red Cross is turning apathy into action today by using the online networks of supporters to reach hundreds of thousands of social media users, part of its bid to re-ignite debate on banning the use of nuclear weapons. 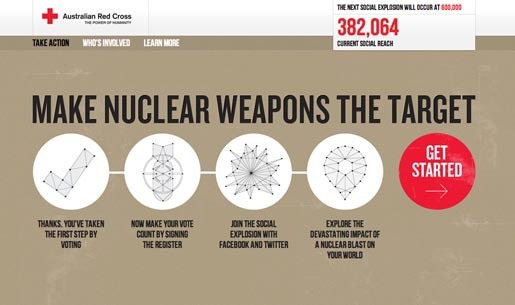 Australian Red Cross has asked supporters of its Make Nuclear Weapons the Target campaign for permission to use their Facebook and Twitter accounts to send a one-time message at 9am today – 14 November – to their friends and followers, creating a social media explosion. 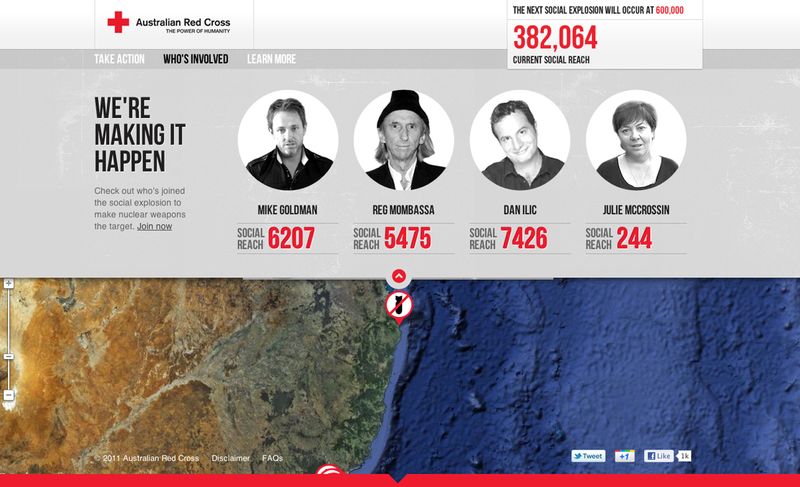 Supporters who have given permission have a social reach of more than 300,000 – their Facebook and Twitter friends and followers. 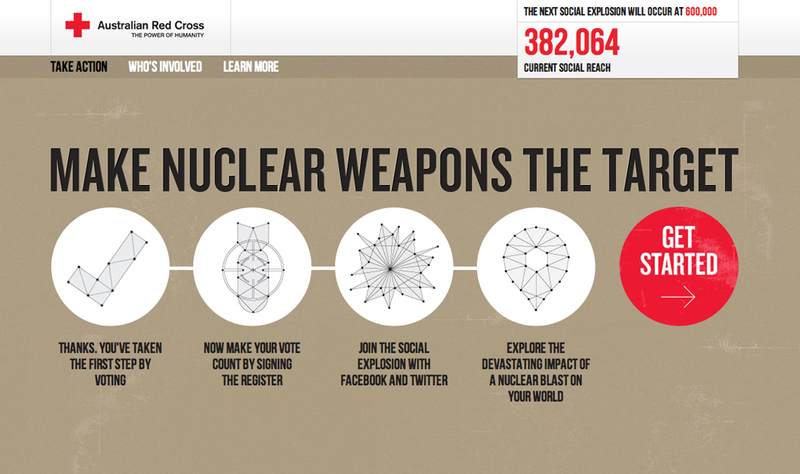 The message asks people to join the campaign and the next social media explosion. Earlier this month Australian Red Cross launched a dedicated website, www.targetnuclearweapons.org.au, where people could sign up for the social explosion, vote on the issue, hear the stories of survivors, and see effects of nuclear weapons via interactive simulations using Google Maps. The Make Nuclear Weapons the Target website and the integrated digital campaign has already scored several industry awards including the CCS Awards’ global site of the day, and has been short listed for the global Favourite Website Awards (FWA). Supporting the call to ban the use of nuclear weapons are well-known Australians such as Ruby Rose, Ash Grunwald and Mike Fanning. 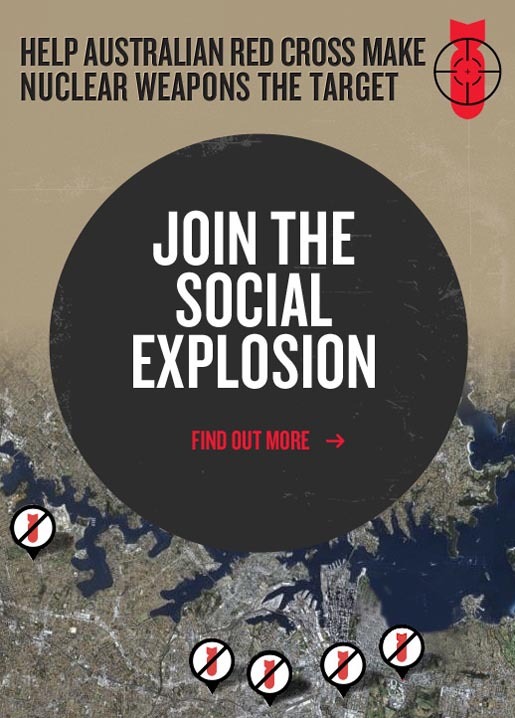 Also backing the campaign is Yami Lester, a survivor of the British Government’s nuclear weapons testing in South Australia in the 1950s, and Junko Morimoto, a Hiroshima survivor now living in Australia. 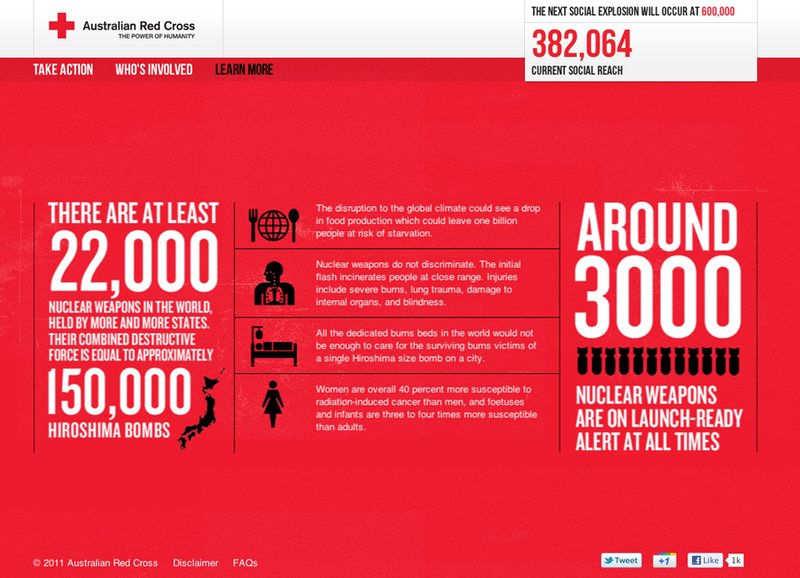 The Target Nuclear Weapons campaign was developed at BWM, Sydney, by executive creative director Rob Belgiovane, creative director Rocky Ranallo, senior digital art director David Cashin, art director Matt Ennis, copywriter Daniel Barrett, executive producer Evan Crompton, TV producer Liz Nunan, digital designers Tyrell Wiswell and Tom Hartney, PR manager Angus Rutherford, senior planner Sarah McDonald, group account director Bard Barber. 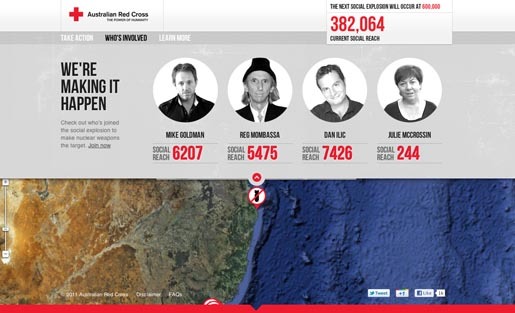 Digital work was done at Pollen Digital by strategist Brett Mitchell, creative director Ross Gales, site designer Darren Cummings, producer Rebecca Smith, technical director Richard Bordes, developers Jay Whitemore and Adam Stone. 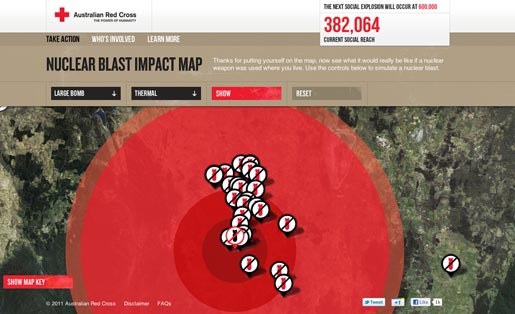 The Target Nuclear Weapons campaign was supported by Australian Red Cross CEO Robert Tickner, head of international law and principles Helen Durham, national director marketing, fundraising and communications Jennifer Gibb, head of communications & brand Sara Morton-Stone, new media manager Michael Turnley, national coordiantor events and ambassadors Rachel Chittick, digital marketing coordiantor Siane Monreal, communications manager services Anita Pahor, Red Cross People communications manager Clare Cameron, head of media Vivian Schenker, media advisor international humanitarian law Kim Batchelor, manager multimedia and publications Phil Brown, multimedia coordinators Drew Weatherstone and Dilini Perera, national manager, strategic growth Caroline Sheehan, creative services director Michael Bailey.